Those who have been anxiously waiting for John Scalzi's best-selling military scifi novel Old Man's War to get a live-action adaptation won't have to be waiting much longer. Syfy and Academy Award-nominated director Wolfgang Petersen will adapt the books for television as a series titled Ghost Brigades, after the second novel in the series. You might remember that Paramount had originally purchased the rights to the Old Man's War novel to make a movie, but those plans fell through. But don't worry that this adaptation is going to skip the events of the first novel; as the author himself explains in a tongue-in-cheek self-Q&A on his website, "The series will pull elements from various books in the OMW universe in any event." 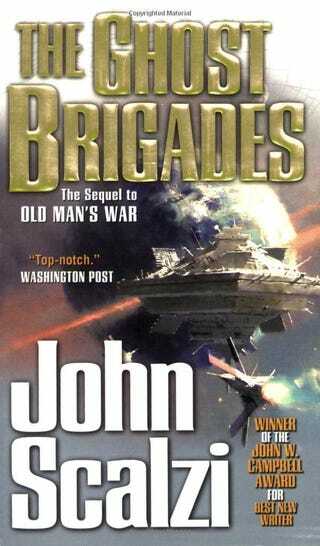 The title "Ghost Brigades" was used for the show instead of "Old Man's War" simply because it sounded "sexier." Ghost Brigades follows John Perry, who at seventy five,enlists into the Colonial Defense Force to fight a centuries-long war for man's expansion into the cosmos. Technology allows experiences and consciousness to be transplanted into younger bodies that are outfitted to endure the harsher rigors of war in space. However, soon after John arrives, he finds himself involved with a mysterious woman, and at the same time, at the center of an unraveling conspiracy involving an elite fighting force known as The Ghost Brigades.